Learning how to pronounce Chinese is one of the first big challenges you encounter when you decide to learn Chinese. The size of the challenge depends on your native language and if it has any similarities with Mandarin or not. I don’t remember having much problems in pronouncing English, Swedish or German while studying them in school, but learning Chinese was a whole another thing. Yes, Chinese pronunciation is challenging, but it’s not impossible! There aren’t any ways to cheat around it, but with a plan and hard work, you can reach your goals and be understood by locals in China. What your goals are, is totally up to you, maybe having survival level is enough or maybe your perfectionist tendencies want you to reach for native like fluency, or anything in between. When I started Chinese lessons back in 2008 I didn’t pay enough attention to the correct pronunciation, especially tones. I thought just speaking a bit more quickly would do the trick. But later on when I wanted to advance from survival upward, I realized learning the pronunciation well is better to be done in the beginning than trying to fix bad habits later on. So here comes my experiences and useful resources I’ve created and found to learn Chinese pronunciation. First of all you need some basic information how to pronounce Chinese and what pinyin is. Your textbook of choice probably has an introduction, but if you find it lacking, there are other good resources to check and learn more. 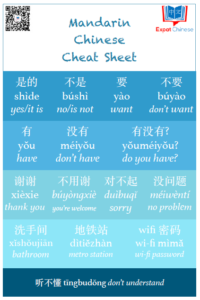 Pinyin quick start guide is a great place to start understanding Chinese pronunciation. While you are reading the theory behind pronunciation and pinyin, also listen to all the sounds and repeat after it. You can find many pinyin table applications in the App Store, for example Pinyin by Chinesepod or Allset Learning Pinyin. Here it’s important to understand that a Chinese syllable has three parts, for example: nĭ (you). The initial is “n”, final “i” and tone is the third tone. Each of these three are equally important and should be seen as one unit. You aren’t learning “ni” + third tone, you are learning “nĭ “. There is also a new Say it Right video course by my affiliate partner ChinesePod, I’ll be reviewing it on the blog soon so stay tuned for that. Starting from the early stages, listening is the first step to good pronunciation. You will first train your ear to hear differences between sounds and tones, after that you can start pronouncing them your self. For example the difference between initials s and sh, c and ch or the differences between tones. A good app to train your ear is Pinyin Trainer by trainchinese. For those of you who really want to get those tones right, try Tone Trainer. It can seem a bit difficult at first, but it’s the best tool I’ve found to learn to hear the differences between tones and test your ear. When learning to pronounce Chinese on your own, go from small to big. First go with one syllable words like yī shí wŭ liù (1, 10, 5, 6), then gradually go to double syllable words and different tone combinations. Gradually go from syllables to words and then to sentences. Listen to phrases and mimic the flow of the language. At the beginning listen and repeat a lot, you will soon notice which sounds are easier for you and which require more work, remember to pay attention to the difficulties, don’t shy away from them. If you are unsure how you are doing, have your teacher or tutor to listen you and correct your mistakes. If you don’t have a teacher, you can try my Pronunciation Tutor Service. Do you have any questions on how to learn or improve your Chinese pronunciation? Please ask away in the comments section and I’ll do my best to help! Maybe you could do some online courses or tutoring? I know how easily you start forgetting languages when time passes.